Overhead lights represent each of the four films highlighted at AoA: Finding Nemo, Cars, Lion King, and Little Mermaid. The seating areas showcase paintings themed to the film represented. Registers on the left, food ordering stations on the right. All the food service lines have cooking areas visible behind them. 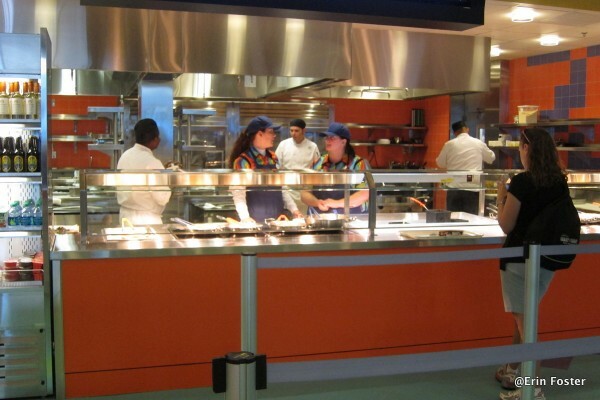 Again, the main refrigerator cases will seem familiar to those who have stayed at value resorts in the past. 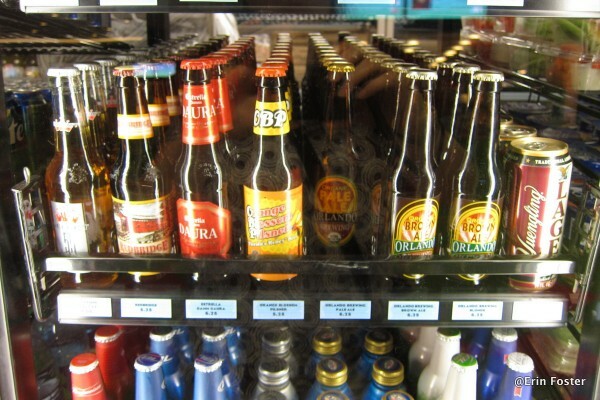 These include a variety of soft drinks, milk, juices, beers, wine, bottled cocktails, cut fruit, and small selection of chilled takeaway items. 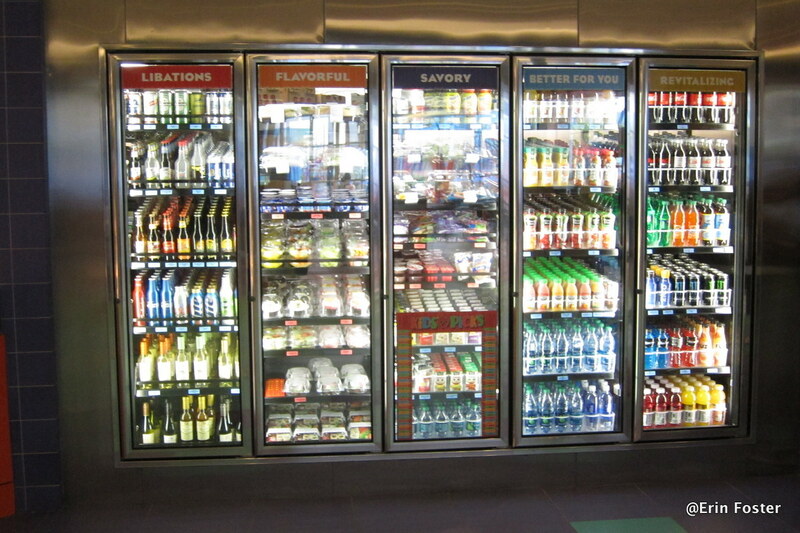 Main refrigerator case. Click to enlarge. Refillable mugs, packaged snacks and cute half bottles of wine. Pre-made sushi in the refrigerator case. 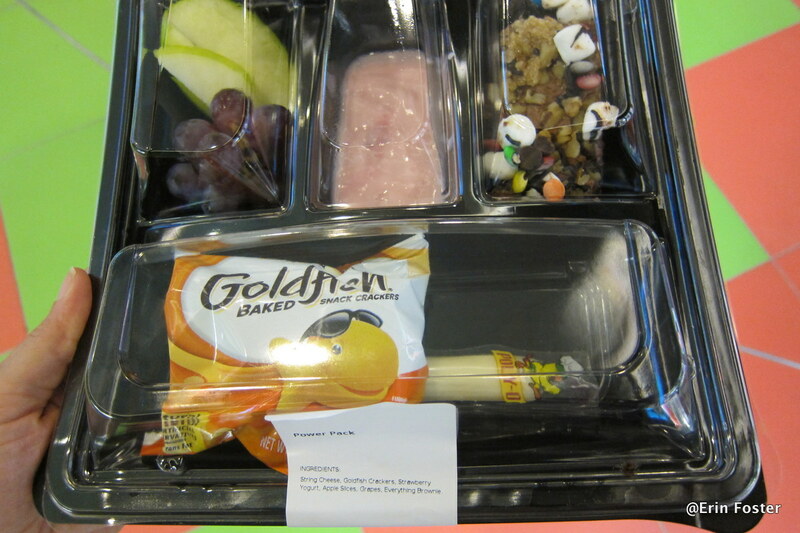 Pre-made kids snack tray. Yogurt in the top center. Pre-made fruit and cheese tray. Along with the standard Bud, there were some more interesting beer choices available. 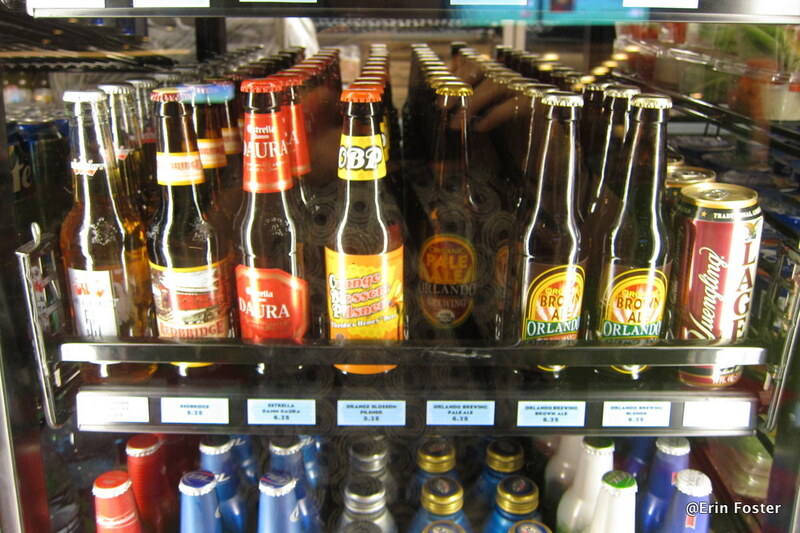 And even bottled hard cider. Yum! 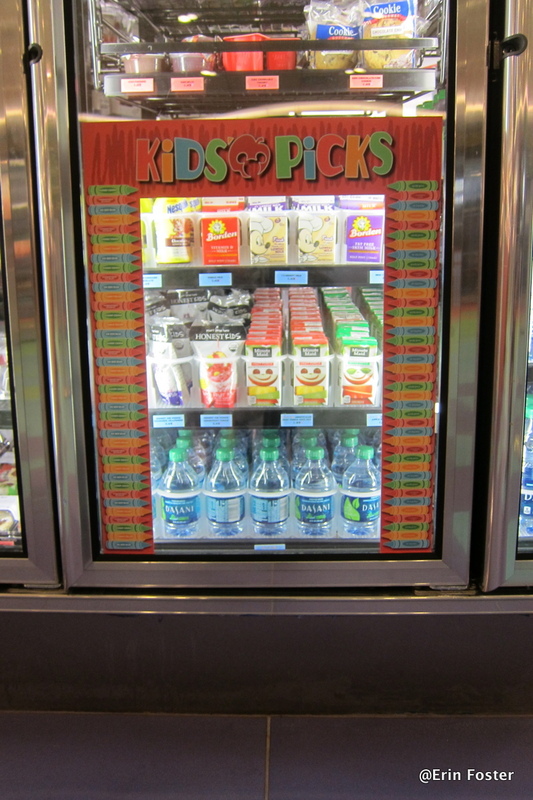 Beverages for kids meals had their own area. 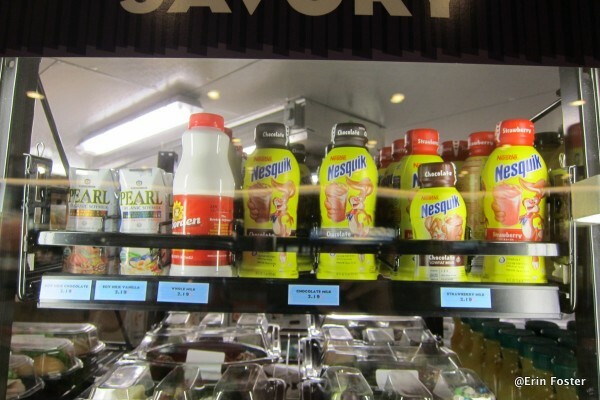 Soy milk is available in regular or chocolate flavors. Pearl brand soy milk available in regular and chocolate. Have a hankering for a late-night indulgence? 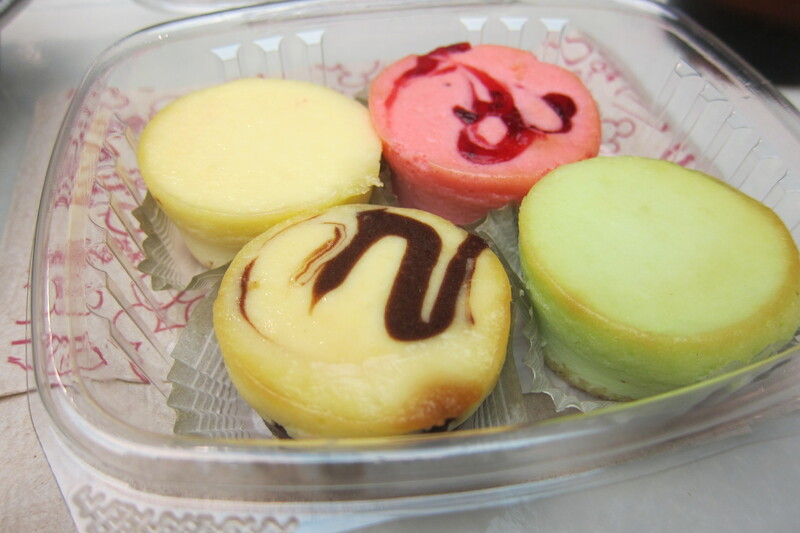 Try the four-pack of mini-cheesecakes or a Macaroon Cupcake! 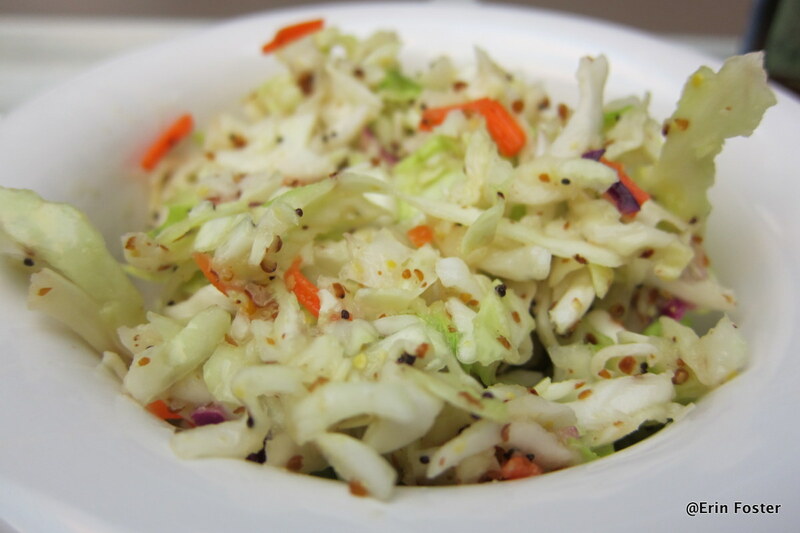 Or go healthy with veggies or yogurt. Cup fruit and veggies, yogurt, and macaroon cupcakes. 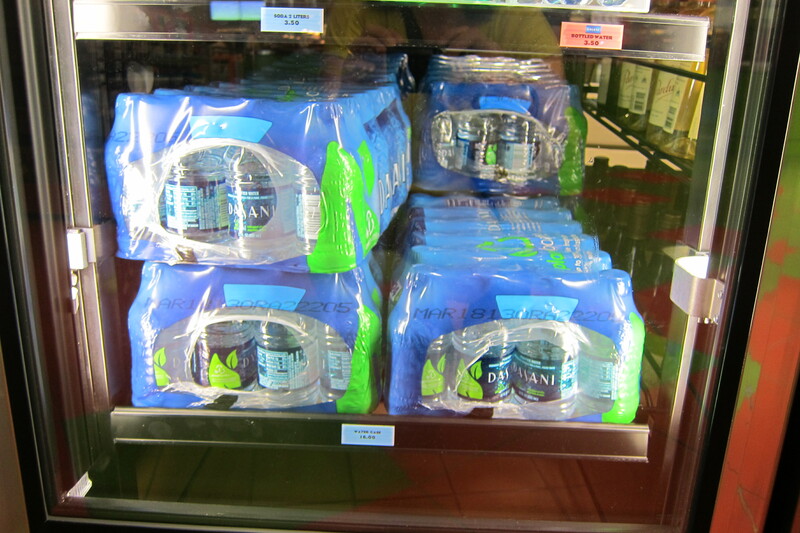 One interesting item in the refrigerator was a full case of water bottles, for about $16. 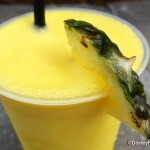 This is more expensive than the supermarket, but a good option over constantly paying for individual bottles at the resort or in the parks. And remember, you can use your Tables in Wonderland card here to get an extra discount! 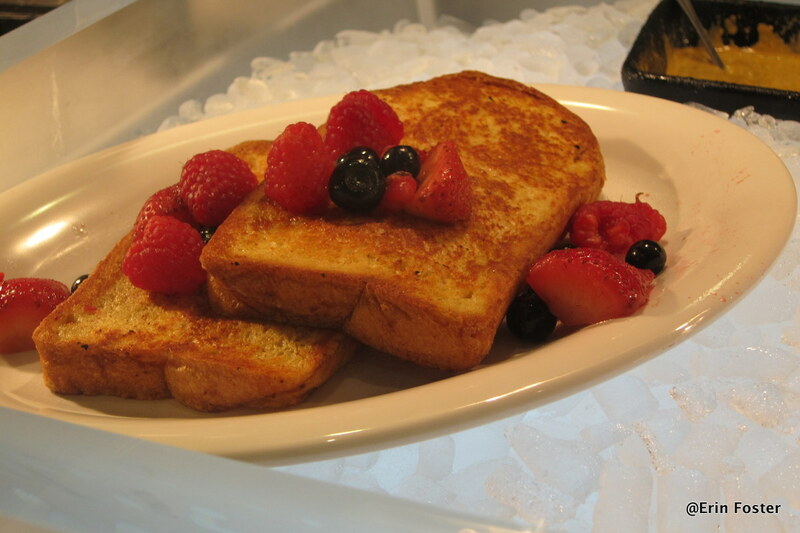 Breakfast is offered from 6:00 a.m. until 11:00 a.m. I happened to eat one day at exactly 11:00 and there was a small bit of confusion about whether we could order breakfast or lunch. 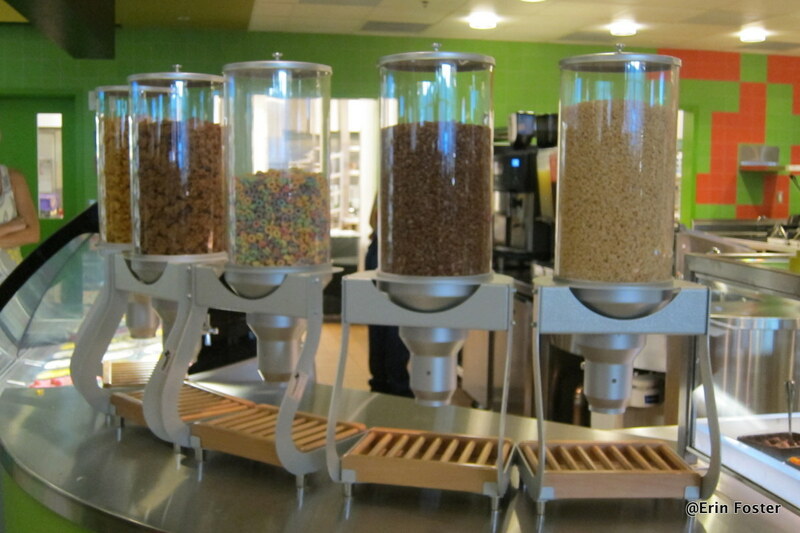 My favorite breakfast station allowed guests to create their own yogurt parfait or blend of cereals. 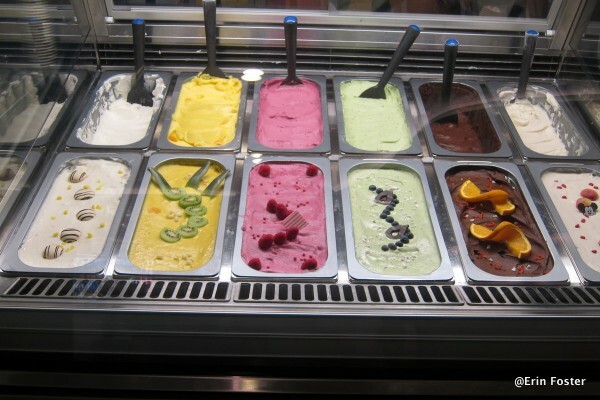 There didn’t seem to be any limit to the number of choices you could make; they’d let you try as many things as you wanted, as long as they fit in the bowl. 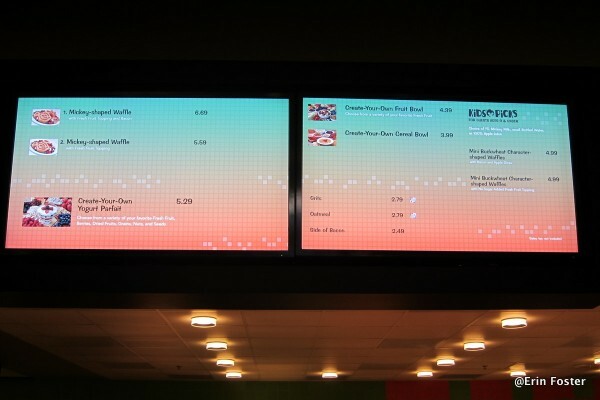 This station also featured the famous Disney waffles! You can watch your Mickey waffle being made. 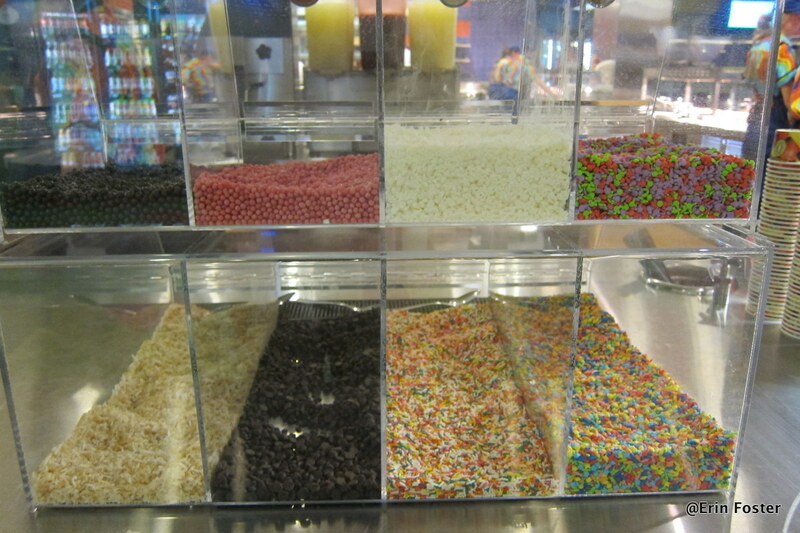 Choices from the cereal bar. 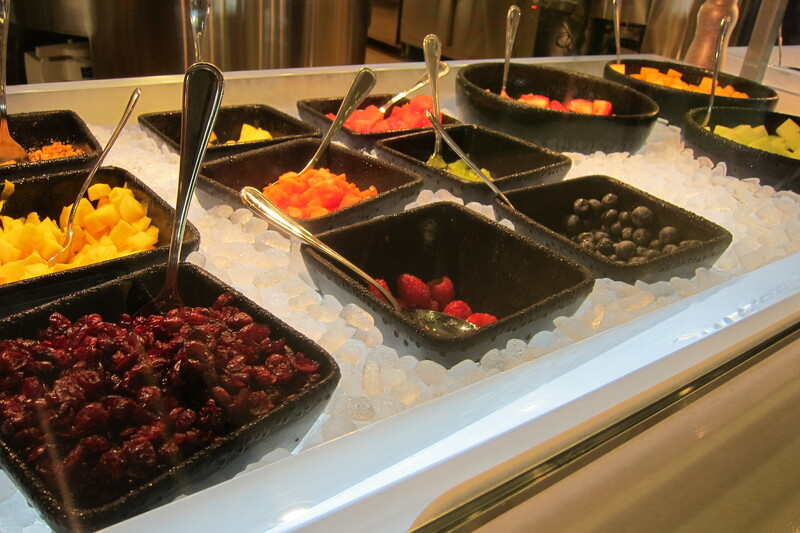 There were very friendly cast members at the make-your-own cereal and yogurt bar, and you’ll find lots of fresh and dried fruit mix-ins. 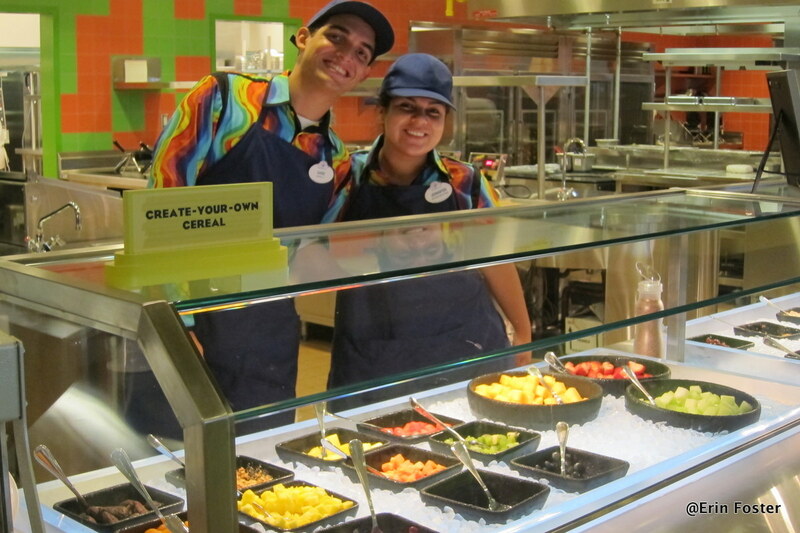 Friendly cast members at the make-your-own cereal and yogurt bar. Lots of fresh and dried fruit mix-ins. Yogurt and ceral fruit mix-ins. 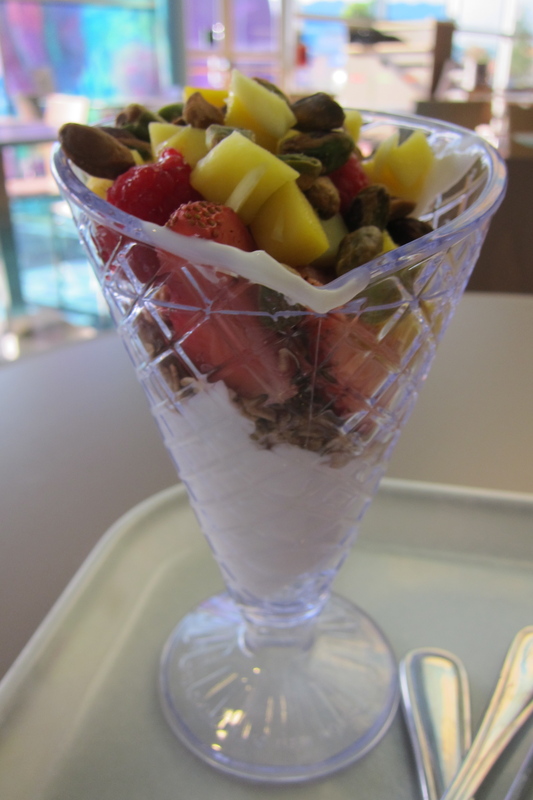 My yogurt parfait had granola, strawberries, mango, and pistachios. My yogurt parfait. With granola, strawberries, mango, and pistachios. Another station has French toast, a vegetarian breakfast sandwich, and a “World Flavors” egg platter. World flavors breakfast foods serving line. Vegetarian breakfast sandwich. I didn't have a chance to try it, but it looked great. I opted for the eggs. At first I was a little dismayed by the potatoes, which appeared to be charred, not just flavored. However, they didn’t taste burnt at all, just a hint spicy. Here, and everywhere throughout the Landscape of Flavors, any time that bacon is offered you have a choice of regular or turkey bacon. I tried both at various points. I found the turkey bacon to be almost Canadian bacon in texture. Good, but not decadent like you want on vacation. 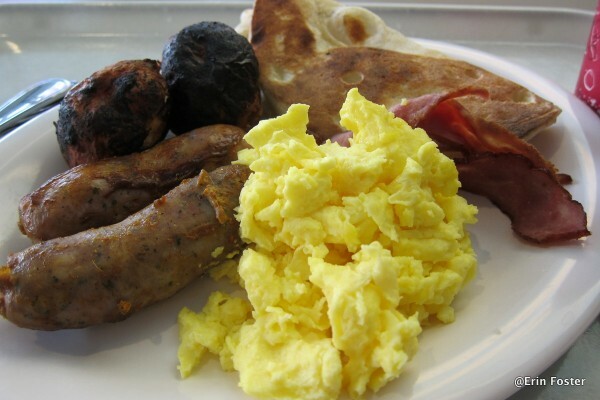 Breakfast platter: Scrambled eggs, naan, Portuguese sausage, breakfast potatoes, and bacon. 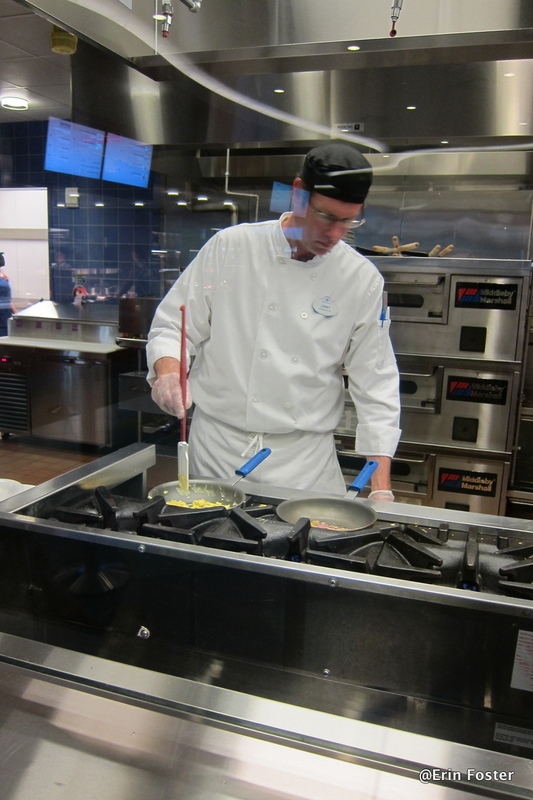 The next breakfast station offered primarily variations on pancakes, along with a breakfast chicken sandwich and a “steak” and egg sandwich. 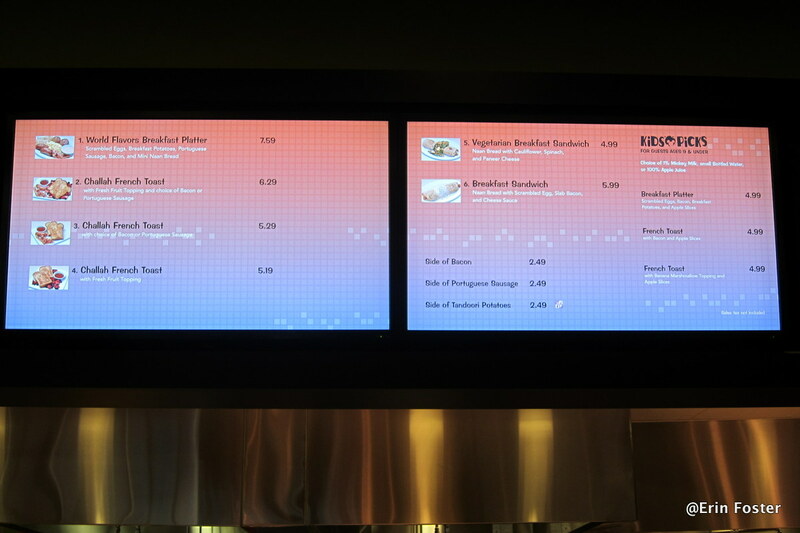 Breakfast burger and pancake station menu. 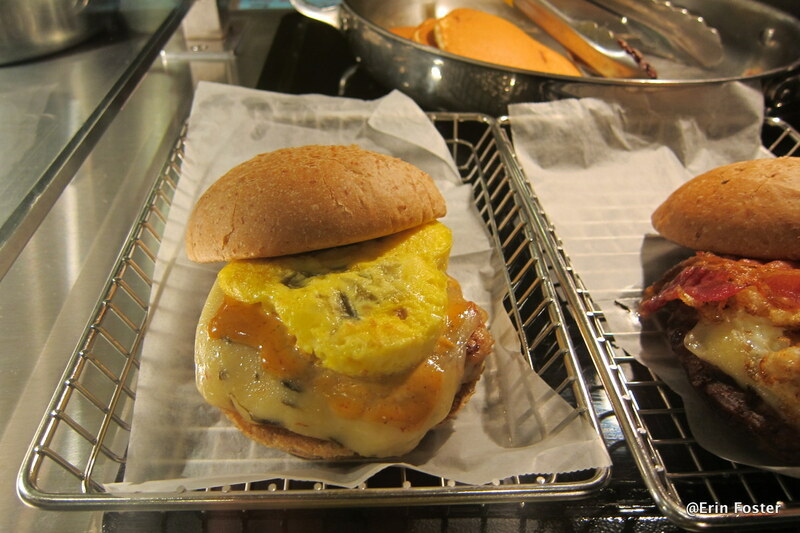 The steak and egg sandwich was really a burger topped with an egg. I didn’t try that item, but spoke to someone who did and really enjoyed it. Breakfast chicken burger with darling Mickey-shaped egg. The pancakes were pretty standard pancakes. When ordered with fruit topping, the fruit is fresh whole strawberries, blueberries, and raspberries, not a compote. 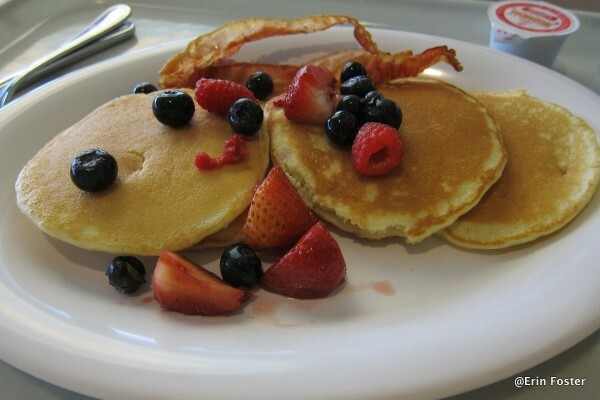 Pancakes with fruit and bacon. 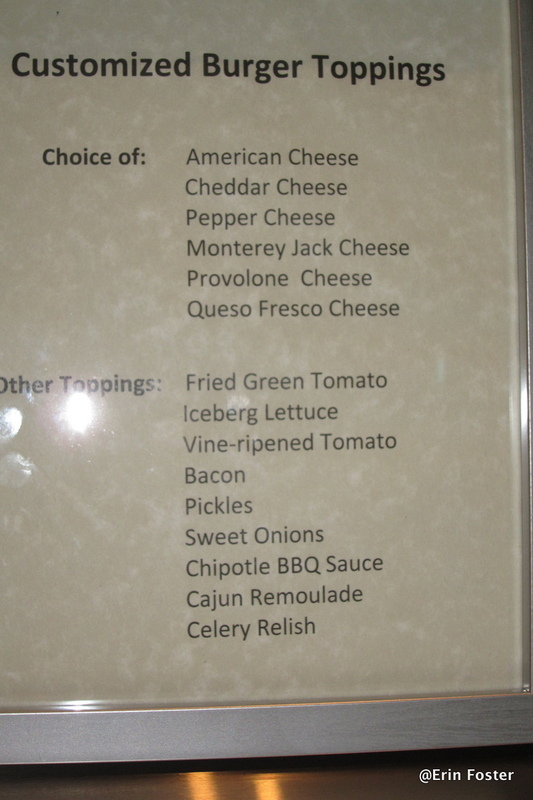 I apologize that I didn’t get a shot of the omelet add-in list. It was fairly standard, with several kinds of cheese, veggies, and meats. Omletes made while you watch. 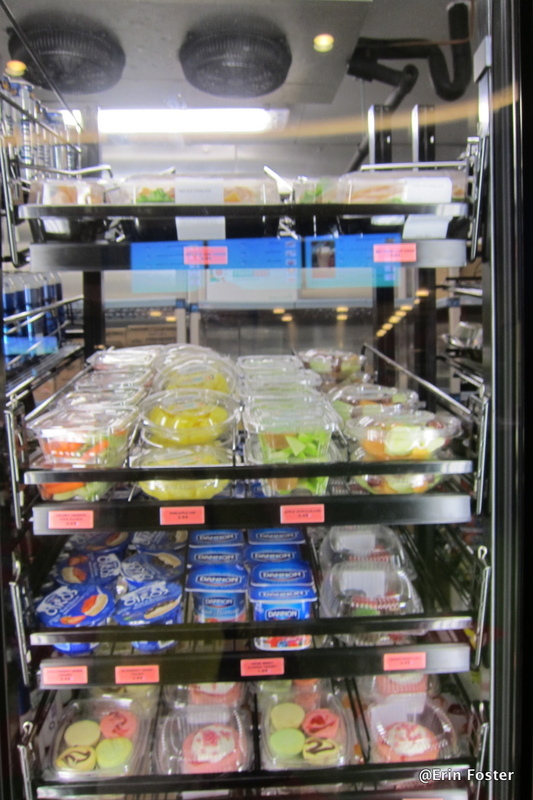 At lunch and dinner, there are four main food order stations: salads and cold sandwiches, Tandoori and Mongolian foods, Italian foods, and burgers and hot sandwiches. 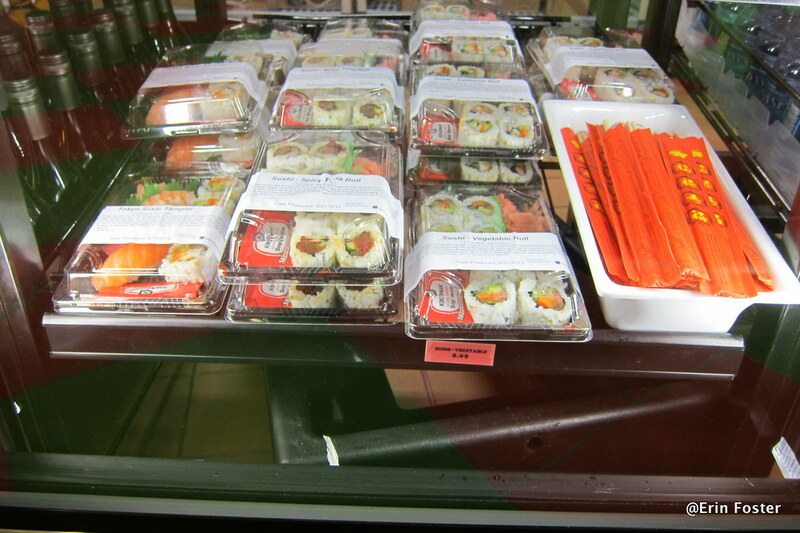 Over the course of four days, I sampled many of the items and spoke to guests who had ordered many others. Salad and cold sandwich menu. 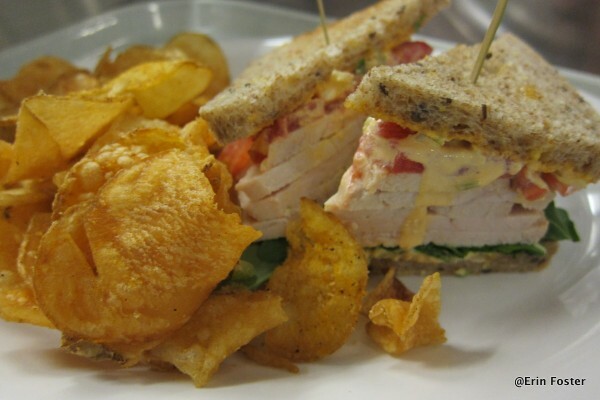 Turkey sandwich with fresh chips. Really, really good chips. Here are a few friendly cast members with the bases for the make-your-own salads. The Tandoori/Mongolian area is more exotic than what you’ll find at many food courts. I think it’s a great addition. Here’s some Tandoori Portuguese sausage with pickled veggies, roasted butternut squash, wild rice, and naan bread. 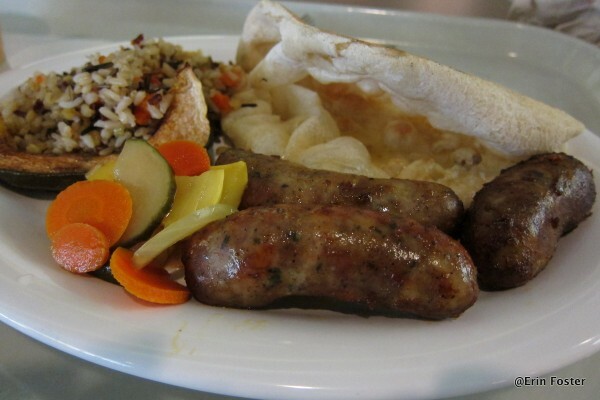 Tandoori Portuguese sausage. 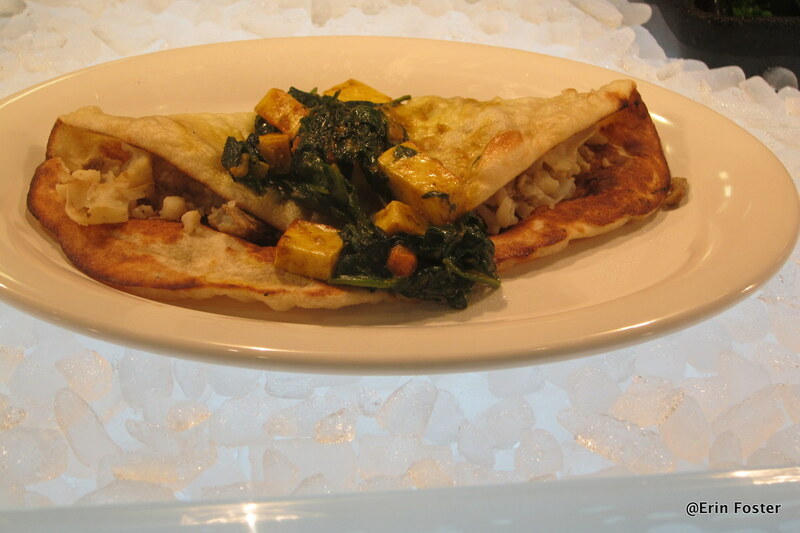 With pickled veggies, roasted butternut squash, wild rice, and naan bread. And my Tandoori shrimp, cauliflower, paneer cheese, and naan dish. 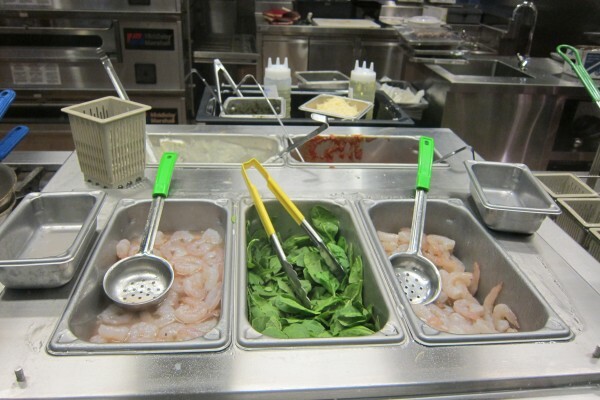 Cooking my tandoori shrimp dish. 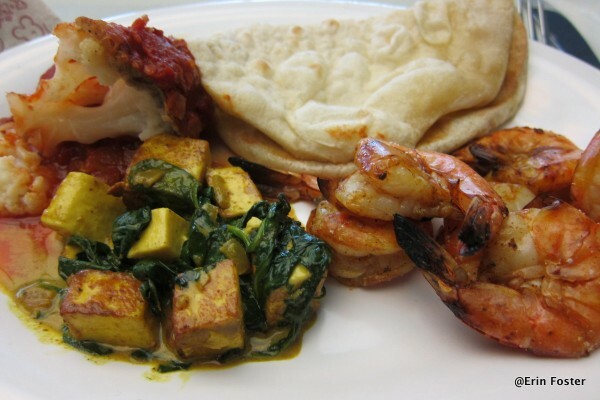 Tandoori shrimp, cauliflower, paneer cheese, and naan. The Make-Your-Own-Pasta area is sure to be a hit. 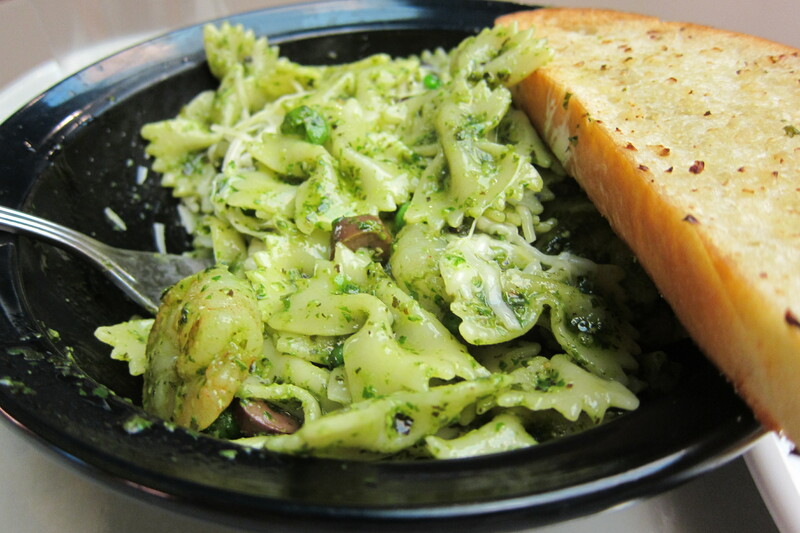 I chose shrimp, peas, and olives with pesto. More ingredients for the make-your-own pasta bar. 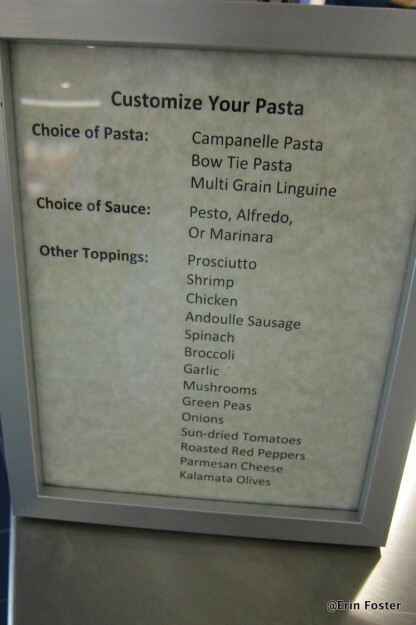 My finished pasta was prepared exactly the way I like it! Toppings to customize your burger. 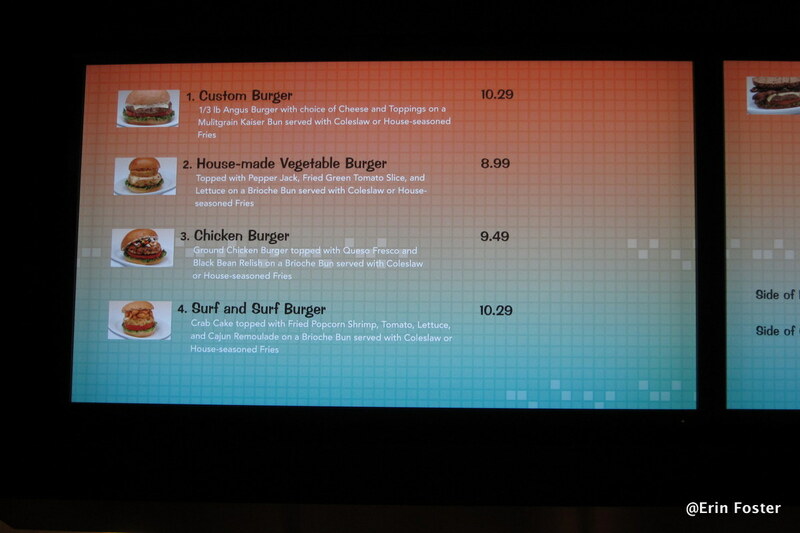 The burger options are extensive here. 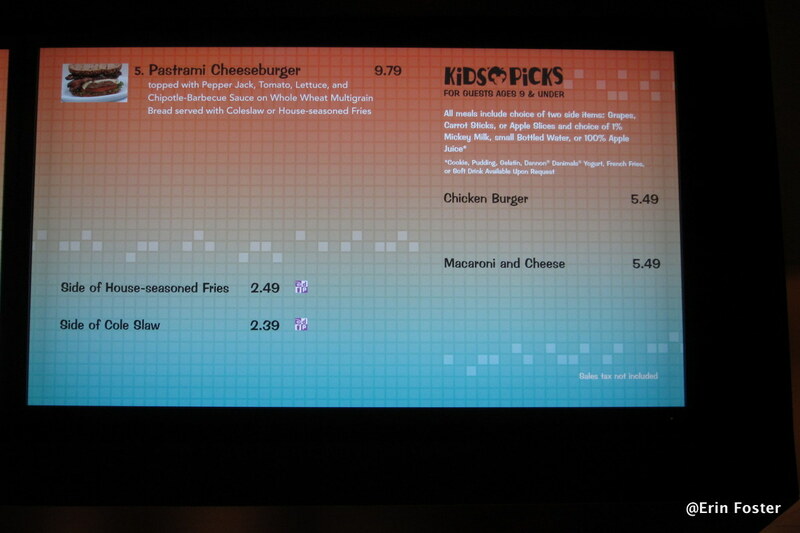 The “Surf and Surf” Burger with popcorn shrimp on top of a crab cake looked great. The "surf and surf" burger. 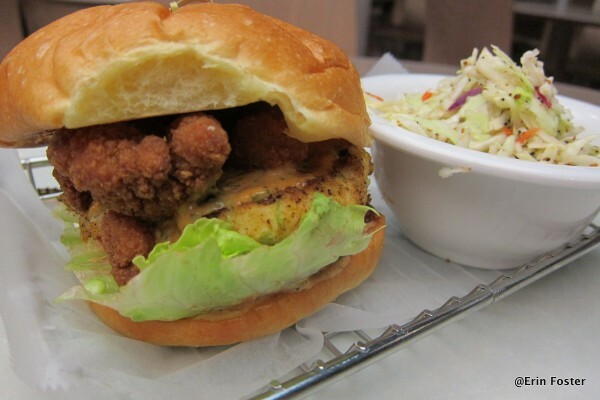 Popcorn shrimp on top of a crabcake. 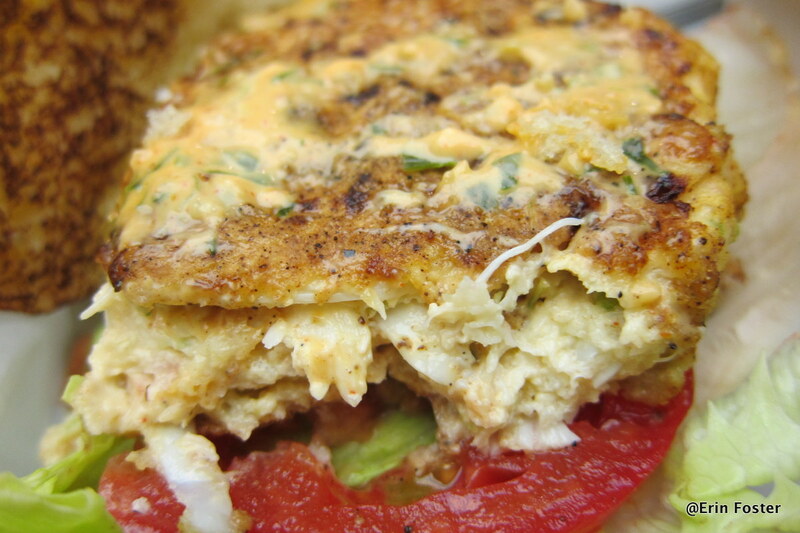 Here’s a close-up of the crab cake itself. Close up of the crabcake part of the "surf and surf". 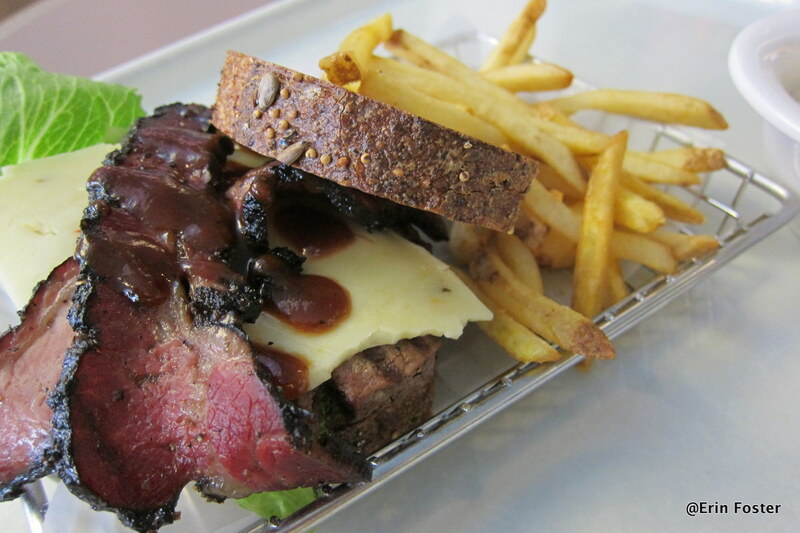 Check out this pastrami burger! Overall, I was quite impressed. The flavors were bold, the ingredients were fresh, and many items were cooked to order right in front of you. 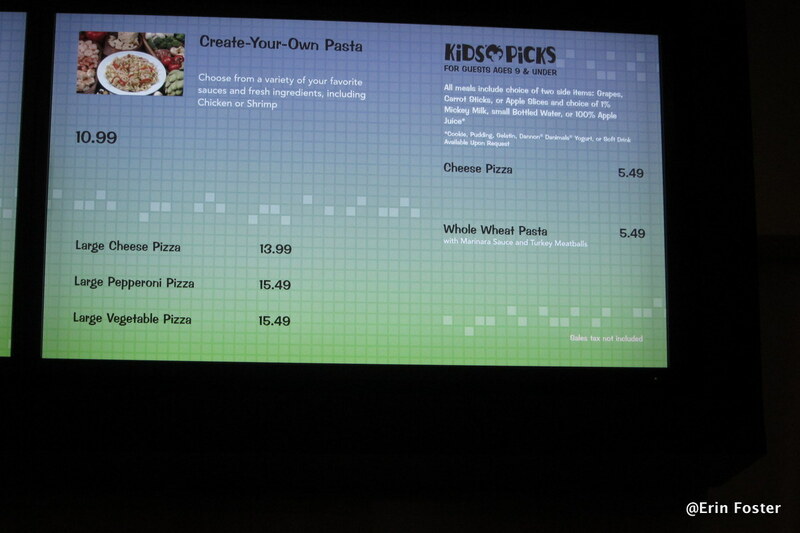 The amount of customization available was staggering, truly a bold step forward for Disney. I applaud this innovation. Big standing O! However, because the food is customized by the guest and cooked on the spot, there was more than a little waiting around. 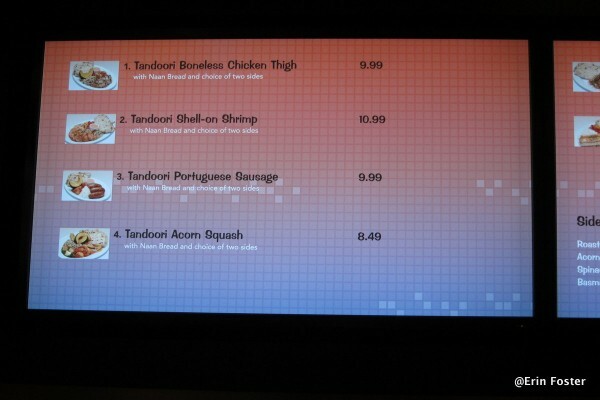 I’d say that I easily spent 4-5 minutes every time I ordered food, waiting for it to be cooked. This was not a huge issue for me, a lone adult, not in a hurry. 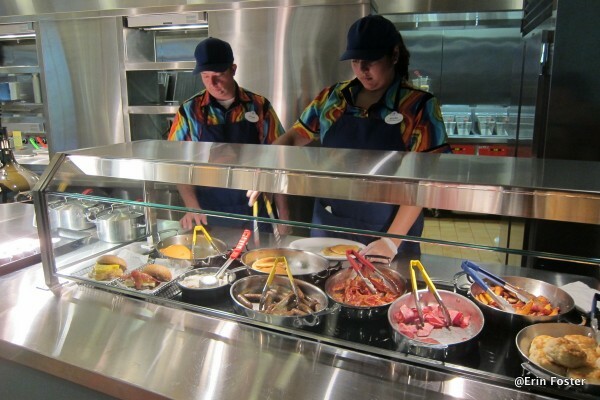 But I fear that when the entire resort is open (I was there for the first phase, with only 1/4 of the guest rooms open) or if I had to wait in multiple lines for multiple family members, it will become common for it to take upwards of 20 minutes just for a family to get its food. On two occasions, I saw women order food at one line, then instead of waiting there, they moved to another line to start a different type of order for another family member. Both times, the cast members at the first station became flustered, not knowing what to do with the order of the non-present guest (who was there, but not right there). The cast had clearly been told not to keep the food under a heat lamp or leave it on the counter, which is wonderful in theory, but seemed to be confusing in practice. My advice is that if you order at one station and then move on to order at another, be VERY clear with the first station that you will be back in a minute and that they should just hold your food for you. 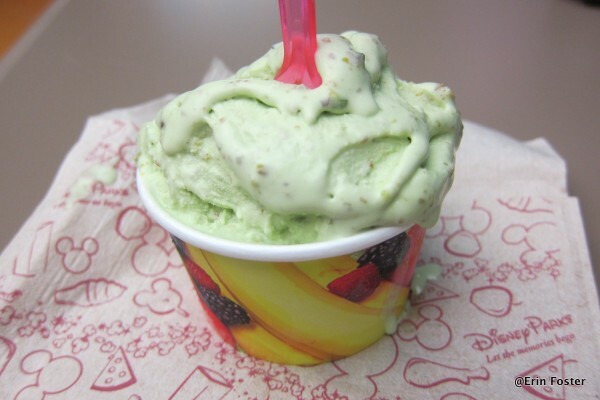 All day long, you can get customize-your-own smoothies, fancy coffee drinks, and hand-scooped gelato. 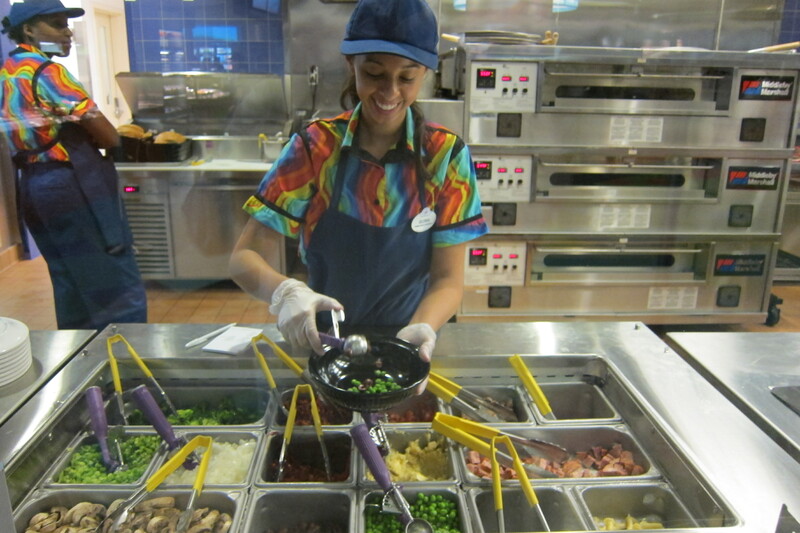 Cast member making my smoothie. 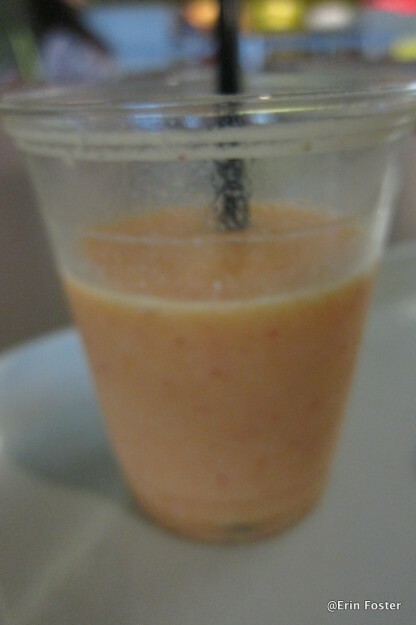 I chose the mango base, with fresh strawberry, banana, and pineapple add-ins. So yummy that I couldn’t wait to drink it. Sorry. I chose the mango base, with fresh strawberry, banana, and pineapple add-ins. 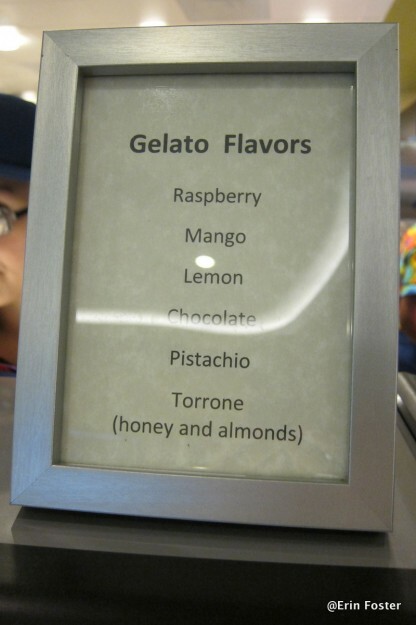 Plenty of topping options for the gelato. Topping options for the gelato. Pistachio gelato. Nothing wrong with that. 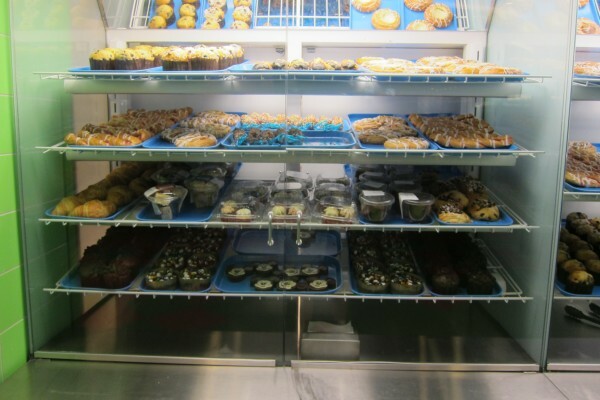 The bakery case is open all day and contains most of the standard Disney food court bakery case items: muffins, danish, cookies, etc. 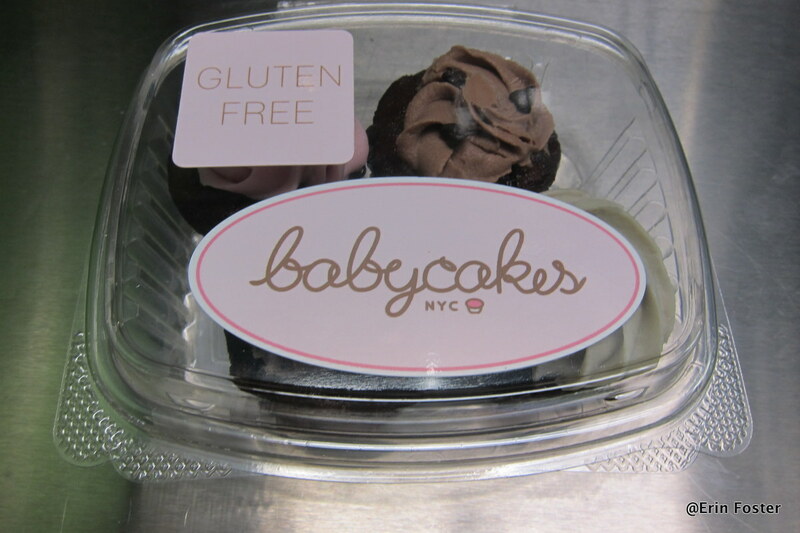 The most notable item in the case was a small four-pack of vegan, gluten-free cupcakes from BabyCakes. 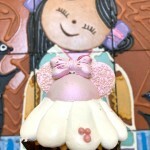 This is the first WDW resort that regularly carries a BabyCakes item on site. 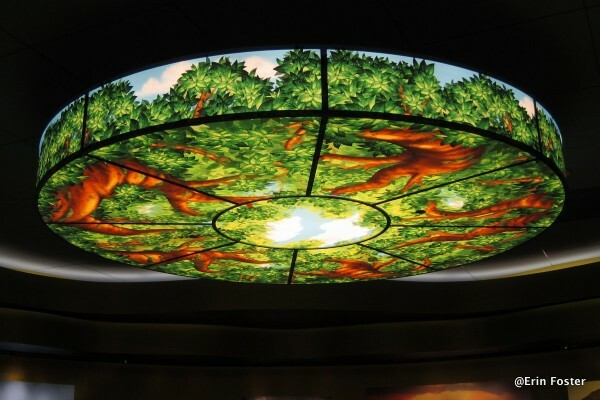 This is a HUGE bonus for families with children with allergies. Babycakes in the bakery case. There was also a cute four-pack of regular mini-cupcakes. Krispie treats in the bakery case. 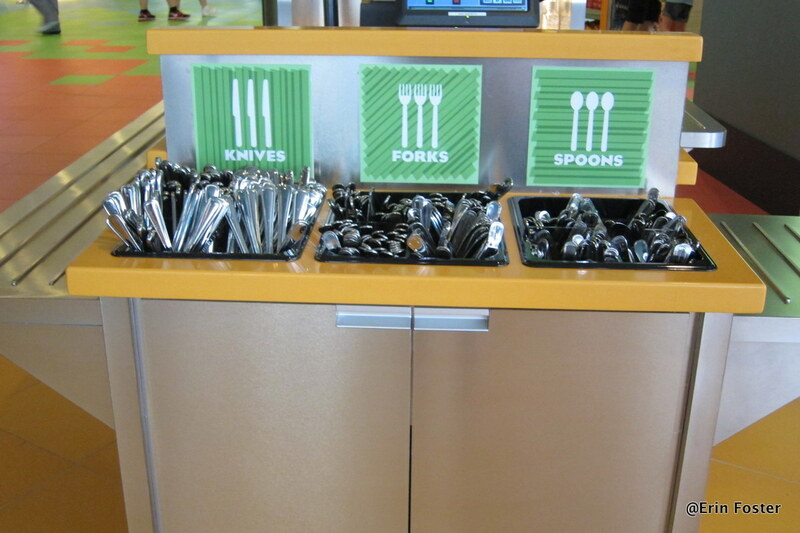 The staff at Landscape of Flavors seemed very proud that they are the first Disney World food court to have real, non-disposable plates and silverware. This was a nice touch while eating and certainly gave a more upscale feel to the meal. 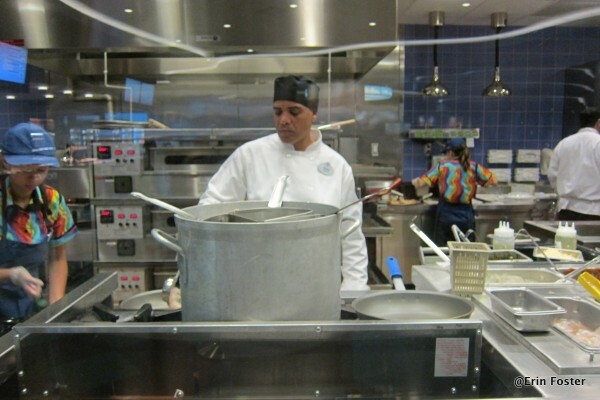 However, the “realness” of the service made it more challenging to clean up after your meal. 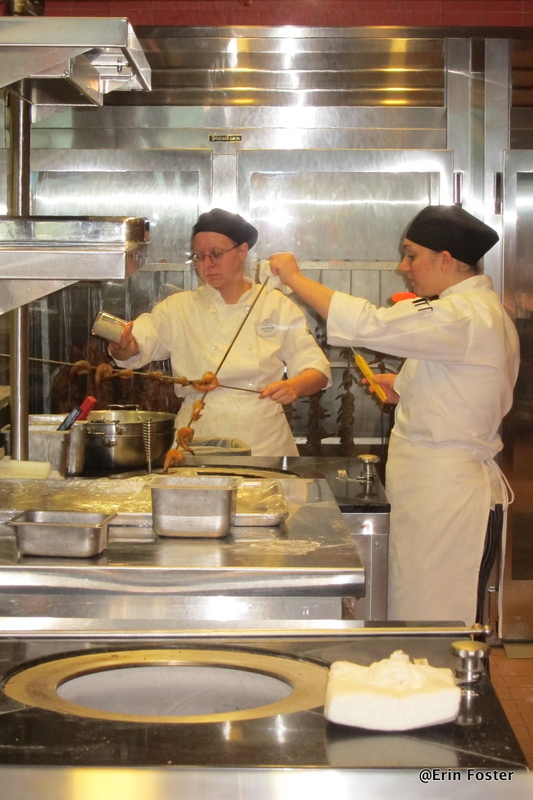 You have to do a lot of scraping of plates and sorting of silverware before you can leave. Of course this is more environmentally friendly than the endless stream of plastic forks and knives, but it does make more work for the guest. Soda options. Including Mello Yellow! 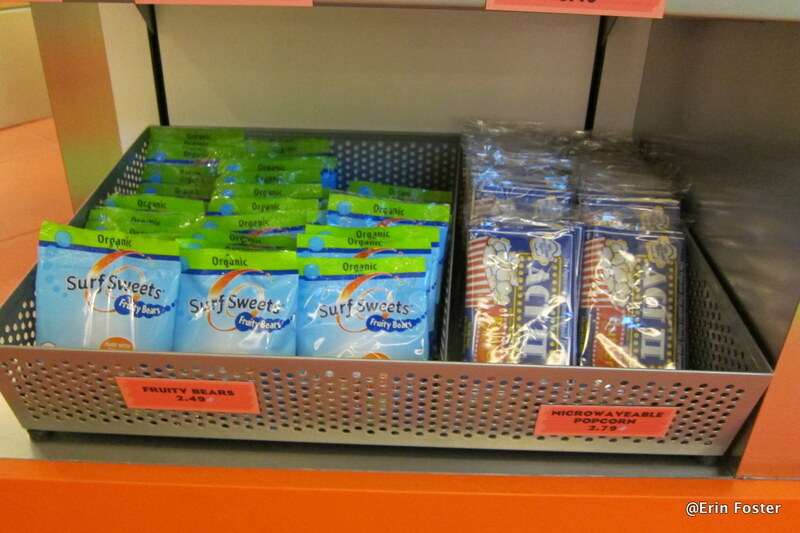 I was a bit surprised that for a resort in which three quarters of the guests DO have microwaves in their rooms, the only real microwaveable item sold at the food court was popcorn; and this was quite well hidden on the bottom shelf of a snack display. 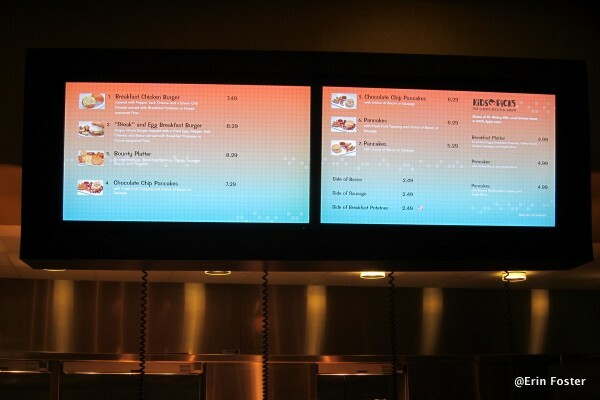 If you’re looking for more substantial microwave food at Walt Disney World, head on over to one of the Disney Vacation Club resorts that have mini-marts in their gift shops. 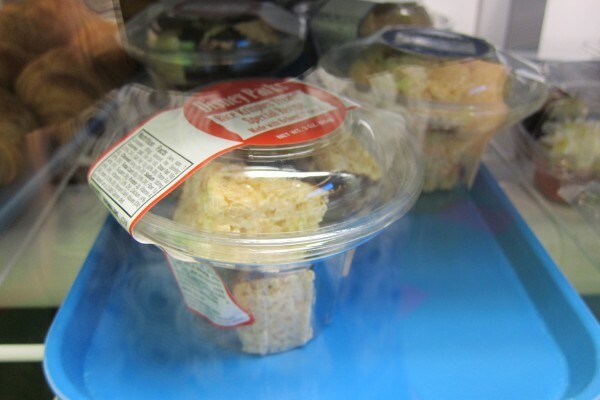 The only packaged microwavable item in the place. My first impression of Landscape of Flavors is that this is a great addition to the Walt Disney World restaurant family. Many of the offerings are unique and relatively inexpensive. There may be growing pains as each wave of the resort opens, but I’m sure they’ll get that all worked out by Christmas. 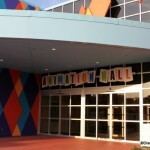 In addition to attracting AoA guests, I suspect that this venue will also become popular with Pop Century Resort guests. I took a walk across the Generation Gap bridge from the Pop to AoA very easily. 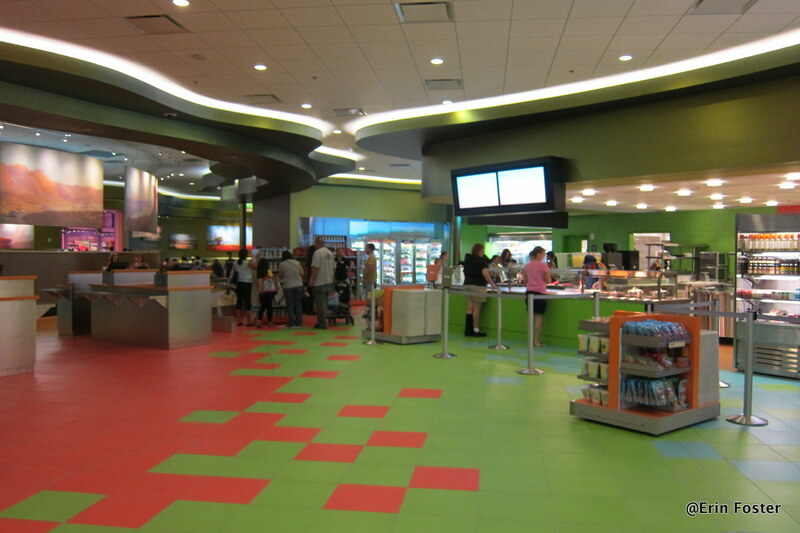 Depending on where your room is at the Pop, the AoA food court may actually be as close as the Pop food court. More options! So future AoA guests, what more do you want to know? Ask me your questions in the comments below and I’ll try to help. Thank you for this detailed review and great photos! My kids have some allergies and sensitivities that have led to us just cutting processed foods out of their diets – they don’t even know what chicken fingers are! This has made meal planning at WDW stressful and expensive. 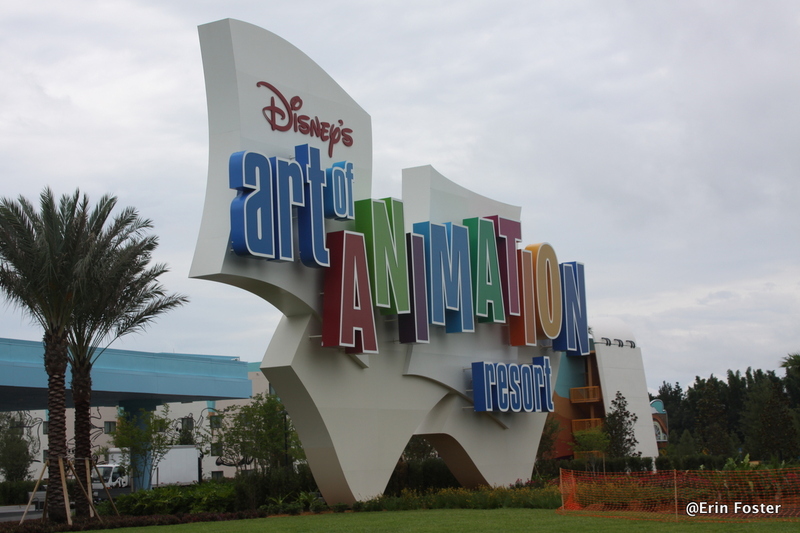 I booked our November trip at AoA because of the suite’s sleeping capacity. I couldn’t be more thrilled to receive this “windfall” – a food court with tons of relatively inexpensive, healthy options. I’m actuallly reconsidering some of our ADR’s to free up time to eat more at our hotel! I’m especially excited to see Babycakes at AoA! 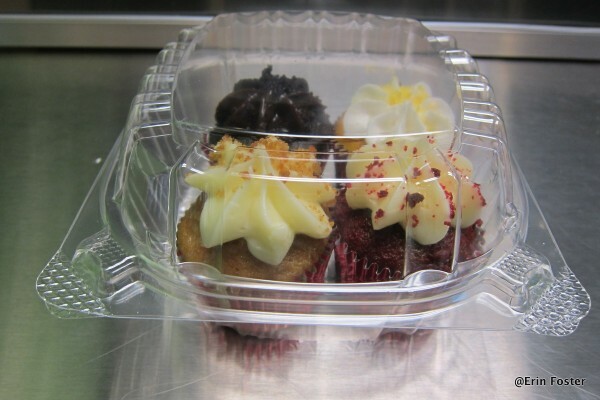 I hope that these packaged cupcakes are as good as the ones straight from their bakery!!! We stop in every couple of months and think those cupcakes stand up to some of the best “normal” cupcakes we’ve had elsewhere in NYC. One question – Are any of the milk or juice box options in the kids fridge organic? 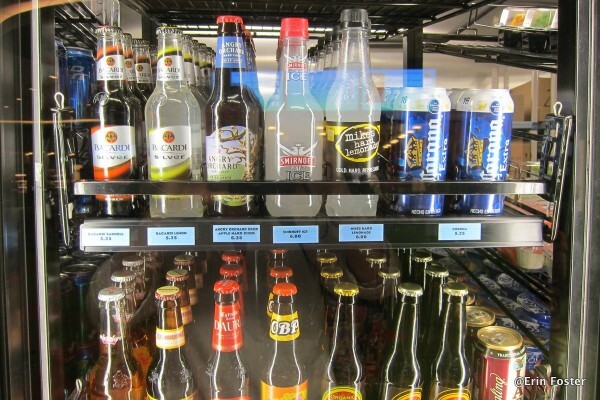 I can see Honest Ade drinks, but the other choices are hard to make out. Thanks!! My first trip to Disney in years is coming up in December. We are staying at AoA and not doing a dining plan. 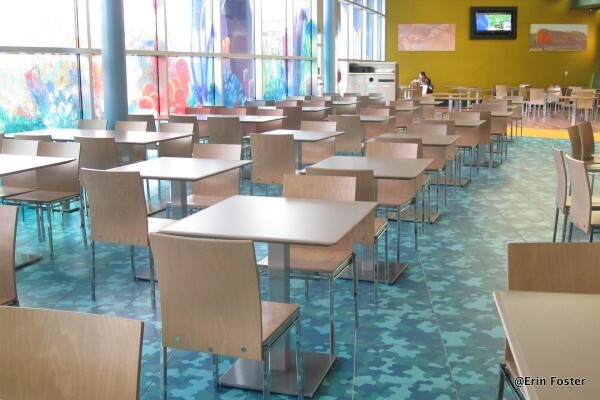 When paying for food, do you pay as you go at the food courts with cash or credit or do they make you charge it to the room? Dumb question possibly but I’m curious! Thanks!! 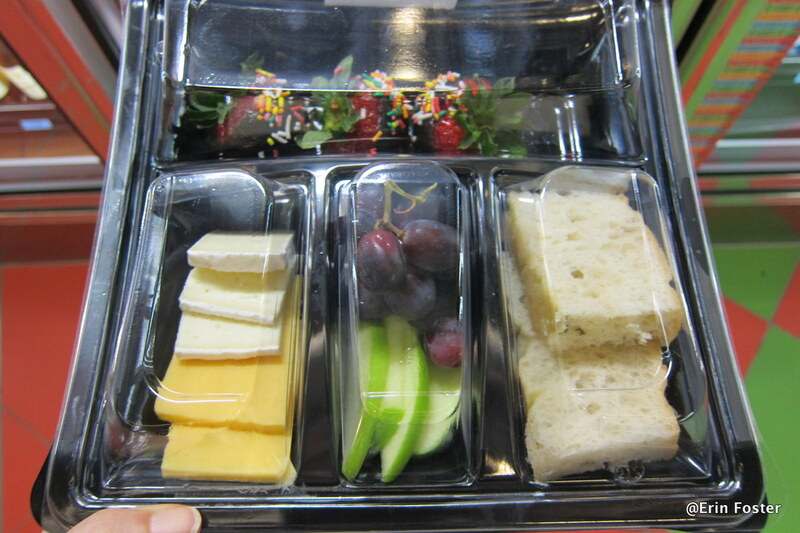 Are the kid snack trays and the cheese and fruit trays a snack option? Or do you know the price on these? Thanks! LOVE the review! 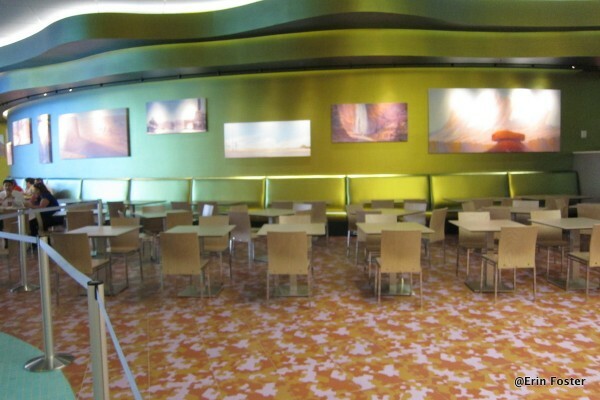 We have stayed at All Star Movies the last 4 Octobers in the Toy Story building for my son, but our trip this October, we’re staying in a LM room for ME! haha! 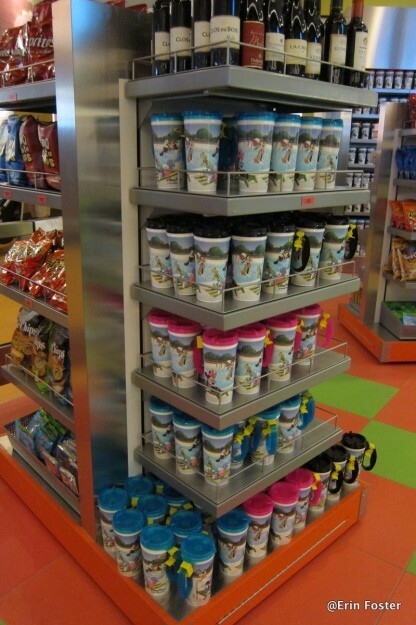 Are you able to access the fountain drinks to refill the refillable mugs after the food court closes at midnight or do you only have until midnight to do your refills? 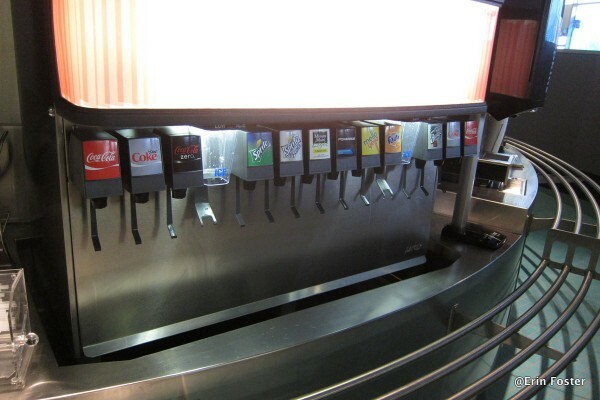 Do they serve Mr. Pibb or Dr. Pepper any where at WDW? Thanks for the details! We will be buying a case or two of water on property rather that placing an order. Are half gallon bottles of milk available for purchase at the resort? 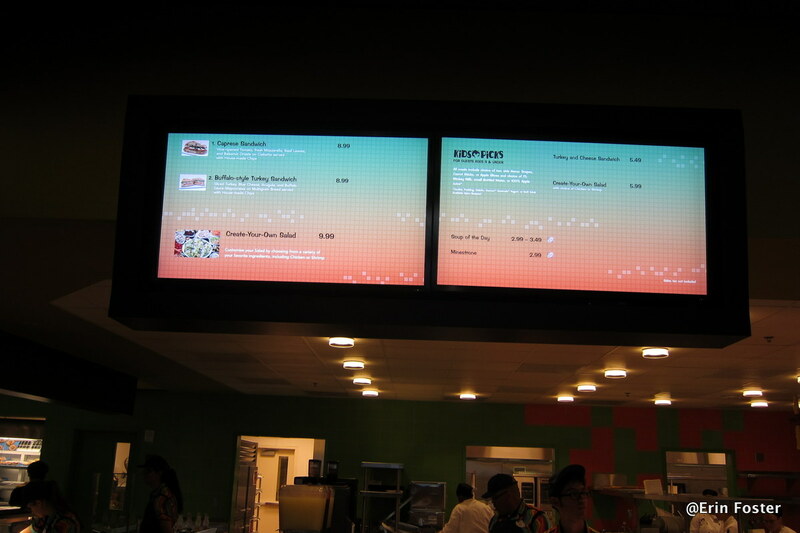 The info regarding Babycakes is good to know, but are there any other gluten-free options for dining at Art of Animation? 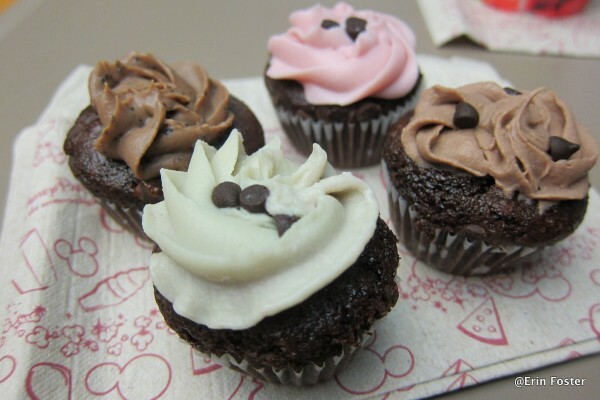 My daughter may think she can dine on cupcakes alone, but mama says it ain’t so! 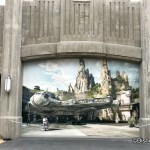 Seriously, we’ve never been to Disney, and are flying in, so won’t have a car to make groceries. I’m trying to figure out what I need to bring with me, to have available in the room. Angel — Check out our details about gluten free dining in Disney World (and other special diets info) here: http://www.disneyfoodblog.com/special-diets-resources/! Thanks so much for your review of AoA. We are going to be at WDW in 6 days, staying at FQ, but definitely plan to visit the new resort and look it over. The dining there sounds just great and plan to try some of their menu. Again, thank you so much for your review. My son is on a low carb, high fat diet for seizures. 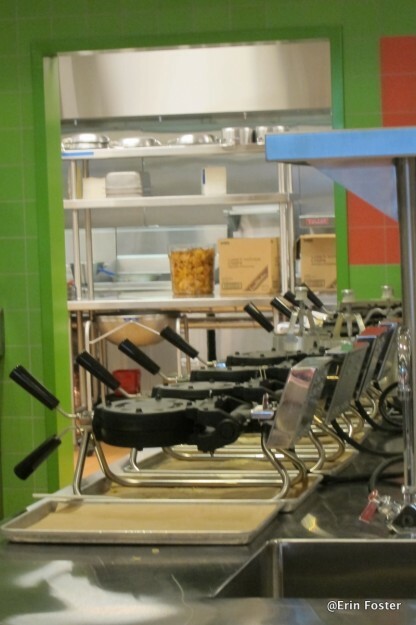 I would like to know if the omelet station is real eggs and can you request them to be made with cream instead of milk. We usu stay at the Poly and get room service for breakfast and they always do this special. My kids really want to stay at Art of Animation, but I am very nervous about the food. Also did u see any sugar free desserts? Hi we’re staying it AOA march 3-7 we costed disney last year and stayed at Coranado Springs. Does AOA have a bar? Coranado did and it was nice to stop in and get a drink. Katye — Absolutely! Drop off pool bar at the Big Blue Pool. 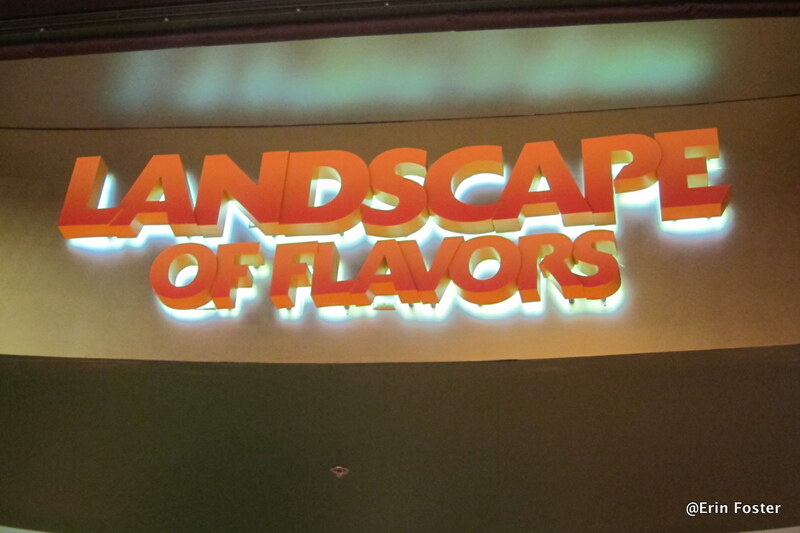 Do you know what type of coffee creamer Landscape of Flavors had? Powder or the little non-refrigerated cups of coffee mate? Or real half n half? Thanks! Love this blog! Arriving last on a Friday Night can you tell me the hours to purchase water, beer and milk at the stores. Hi! 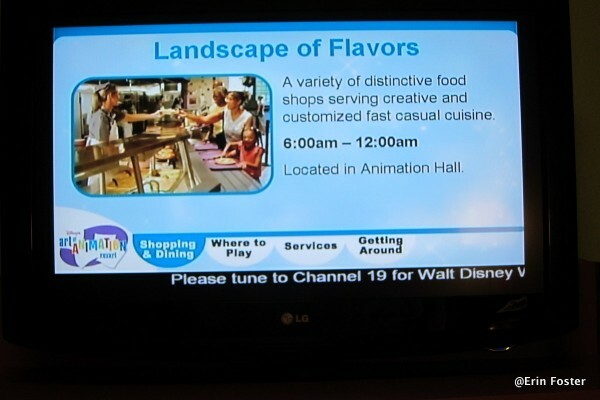 Is the Disney Dining Plan accepted at Landscape of Flavors. 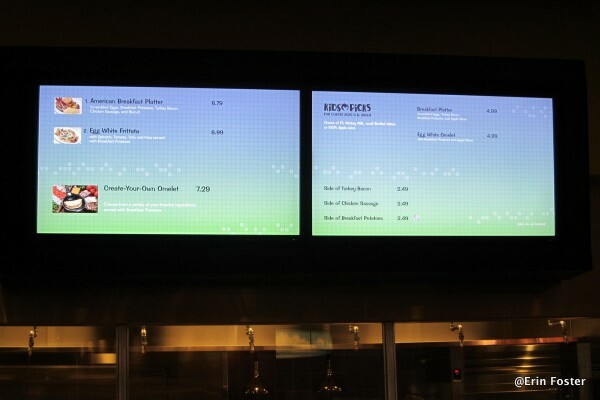 Your photos showed just a few items (likes sides) with the Disney Dining Plan emblem next to them. Didn’t seem everything was covered? Thanks. 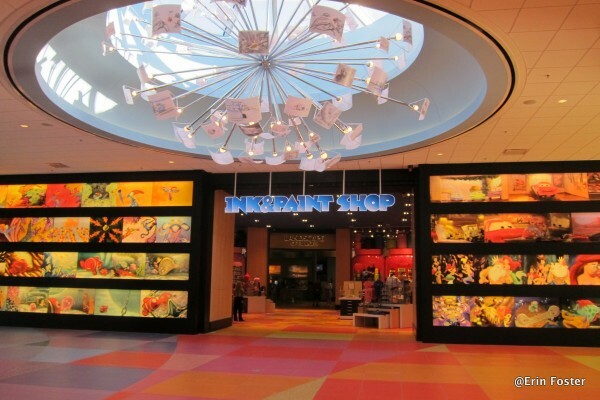 Joan — The store at Art of Animation closes at midnight, I believe. Just noticed these comments being posted and thought I’d follow up. 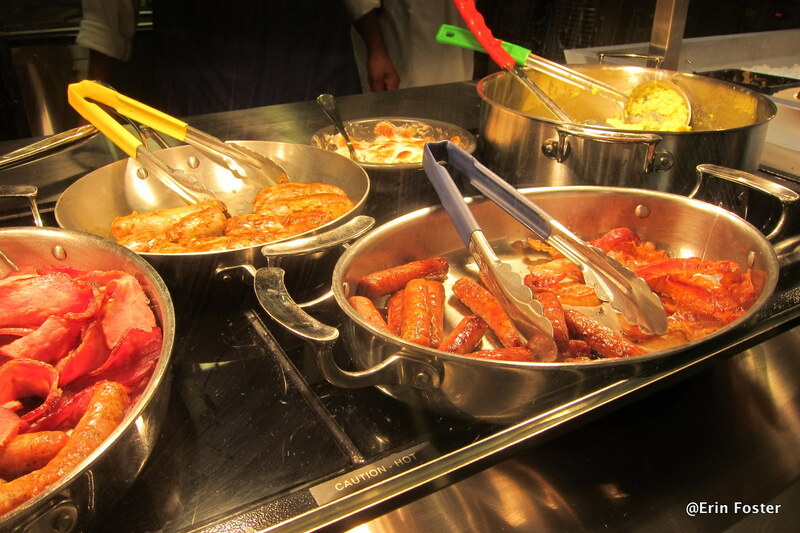 We stayed for 10 days in November and LOVED the resort, including the Landscape of Flavors. The only item we didn’t thoroughly enjoy was the Tandoor shrimp. The meal had good flavor, but the shrimp are cooked in the shell, which the meat seemed melded to. It took way too much time and energy to pick apart. 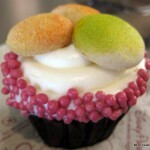 Otherwise, our favorite was the Babycakes cupcakes. Those four little cakes are a lot of dessert on a dining plan credit. My husband and I would share one set for dessert during the meal and save the other set for a late night snack with a decaf tea after the parks. We’d definitely stay again. I remember the tap water in Florida as being chlorinated and unpleasant. Is the drinking water from the machines filtered? Would you happen to know if the room water is filtered, too? 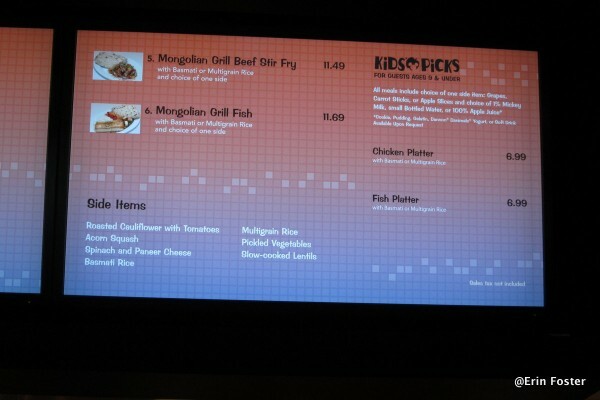 Are there microwave , that guest can use in landscape of flavor??? That music loop certainly gets repetitive! 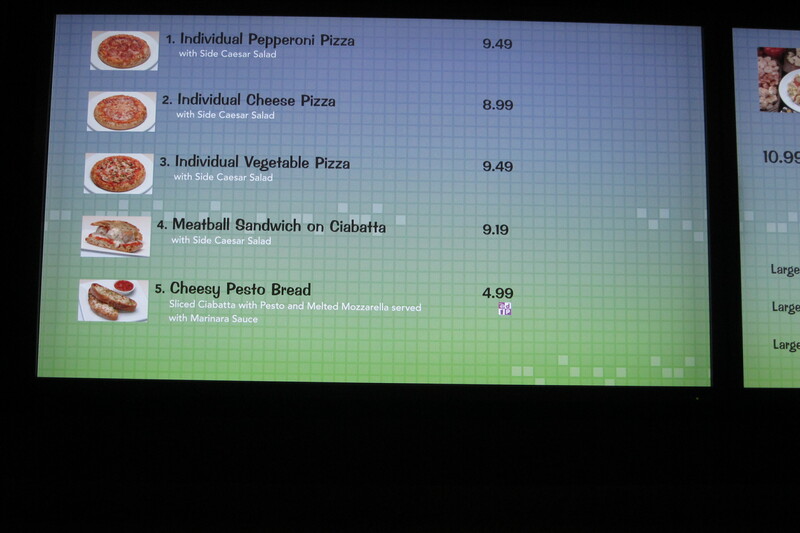 Also very disappointed with recent menu changes. My question is kinda specific– At the cereal bar, is there a dairy-free milk option? Or lactose-free/soy/almond/whatever? 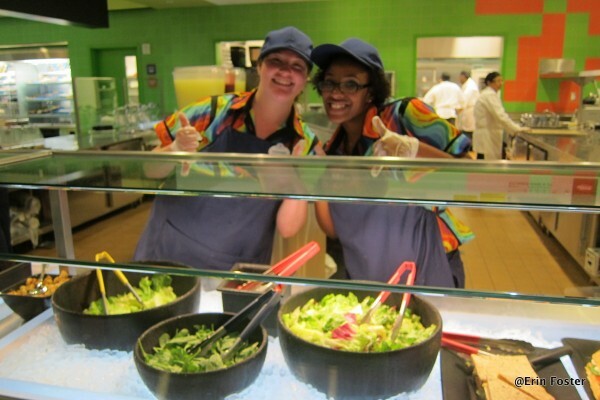 Cassie — With Disney’s commitment to serving guests with food sensitivities, I have no doubt that a cast member could provide a dairy-free option. 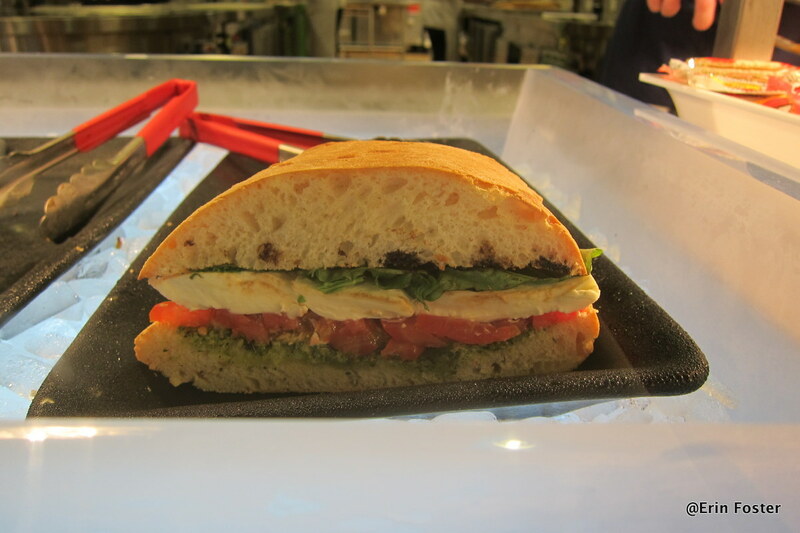 Can you purchase fresh bread and Mike in the food hall. I am just wondering if there are flavored creamers for coffee? Thanks! Ashley, we can’t say for 100% sure that they don’t, but the food courts generally have dispensers for the creamer, so we don’t think there are flavored options. 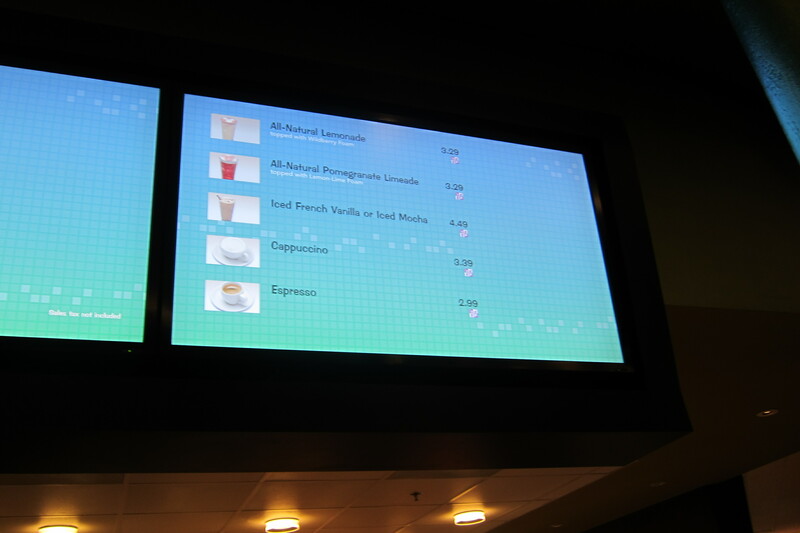 As for Joffrey’s Coffee Stands and Starbucks, you might find more options.